For our recommendations on spending Valentine’s Day on International Drive, the top 10 romantic restaurant choices over the years may have varied over time but the dining scene definitely changed with the most recent incarnation of Pointe Orlando a few years ago. Pointe Orlando was once known for an FAO Schwarz Toy Store and a short-lived Pac-Man Cafe. Now the area has transformed itself with many upscale and well-received national restaurants that make it a top choice for convention-goers in the area and locals alike. In fact, 6 of our top 10 restaurants for the best romantic restaurants on International Drive are located in Pointe Orlando. This is Orlando Local Guide’s Top 10 Romantic Restaurants on International Drive in Orlando for Valentine’s Day 2016 including Pointe Orlando. #1. The Capital Grille – The Capital Grille has almost single-handily changed the perception of dining on International Drive with it’s corner location at International Drive and Pointe Plaza Avenue across from the convention center. The Capital Grille is a classy upscale steakhouse that will make any date feel special and is a great place to spend Valentine’s Day or an anniversary. Start off with the Wagyu Beef Carpaccio with Wasabi Argula and then choose from the different Dry Aged steak choices of New York Strip, Porterhouse, or Sirloin. Filet Mignon and Double Cut Lamb Rib Chops are also available. On the Seafood menu is Broiled Fresh Lobster, Grilled Swordfish, Sushi-Grade Sesame Seared Tuna, and Seared Citrus Glazed Salmon. #2. 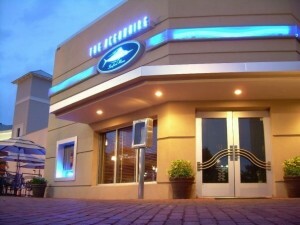 The Oceanaire Seafood Room – Immediately located next to the Capital Grille in Pointe Orlando is The Oceanaire Seafood Room. The Oceanaire is the first of two Seafood Restaurants on our list that we recommend that has a setup in which the service is delivered as if you are on an upscale restaurant on a cruiseline. 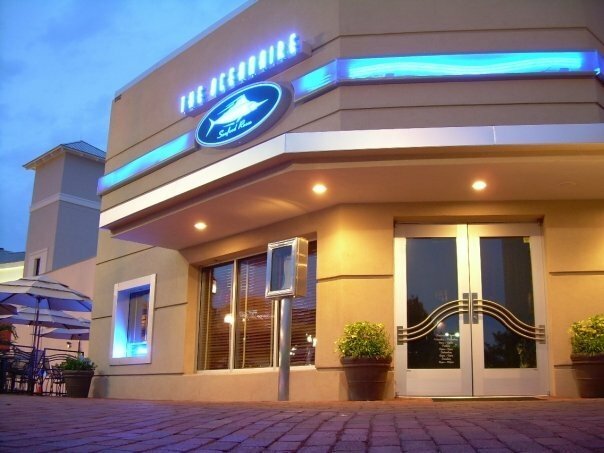 The service matches the quality of the dishes that we have experienced at The Oceanaire in which you can go for the Chesapeake Bay Style Crab Cakes, Stuffed Flounder Florentine, or the “Black and Bleu” Florida Black Grouper. On the Meat offering, Filet Mignon, New York Strip, and Pork Chop’s are available. #3. Maggiano’s Little Italy – Our third restaurant at Pointe Orlando, Maggiano’s Little Italy, is the upscale big-sister restaurant to Romano’s Macaroni Grill. We like Romano’s in our Waterford Lakes and UCF Top 10 romantic list and we also like Maggiano’s on this list. Some of the interior of Maggiano’s looks similar to Romano’s but with more upscale touches and the menu is different in that the selections are meant to be shared (similar to Buca di Beppo). Menu items include Chicken & Truffle Tortelloni, Gnocchi & Italian Sausage, Chef KB’s Lobster Carbonara, Taylor Street Baked Ziti, and Mom’s Lasagna with Marina or Meat Sauce. #4. Marlow’s Tavern – At this point of the top 10 list, I first have to start this entry with a disclaimer that I was a guest of Marlow’s Tavern when the restaurant first opened in Pointe Orlando in 2012. Stating that, Marlow’s Tavern belongs on the top 10 list of best romantic restaurants because the dishes are great and the restaurant provides a small and intimate space that is great to share in with a loved one. If you enjoy going to other gastropubs in Orlando like the Ravenous Pig in Winter Park and the Rusty Spoon in Downtown Orlando, you will also enjoy Marlow’s Tavern. Southern-inspired dishes with grits on the side are at the center of the menu. Click here to read our full review. #5. Taverna Opa – If our first four restaurants at Pointe Orlando deliver a nice and quiet romantic experience for Valentine’s Day, our next two restaurant experiences deliver something a little more lively and fun. Taverna Opa is one of the best Greek Restaurants in Orlando that combines adventurous Mediterranean dishes with belly dancers on tables that encourage guest participation as guest and servers throw napkins up in the air. I would consider myself a pretty quiet person in general but the people at Taverna Opa really help to setup the dining experience in a comfortable way to help you let your guard down and just have a good time. Opa! Get our favorite Saganaki Flaming Cheese to start and then choose from Lamb Chops, Lamb Shank, an Oak Grilled Pork Loin, Chicken Artichoke, or Stuffed Peppers as a meal among others. #6. B.B. Kings Blues Club – If you enjoy live music with your meal, B.B. Kings Blues Club is a great romantic option for Valentine’s Day with a little bit of Memphis bar-b-que at the top of the menu items along with other hearty items like Chicken Fried Chicken and Born on the Bayou Shrimp and Grits. Fine dining it is not, but B.B. Kings Blues Club’s B.B. King All Star Band that plays at 7:30 pm and 11:30 pm is one of the best cover bands that we have heard in the city that plays many classic cover songs that you will be sure to recognize. #7. Charley’s Steakhouse – Our next two restaurants come from the “Talk of the Town” Restaurant Group that have been serving great steaks and seafood in the International Drive area for many years. Charley’s Steakhouse serves up some of the best steaks in Orlando that features only grain-fed USDA Prime & Choice beef that is aged on-site for 4 to 6 weeks prior to being served. Steaks are flame-grilled over a 1200-degree open pit that is fueled with a combination of oak & Florida citrus wood for flavor. #8. Fishbones – Not to be confused with the Bonefish Grill Seafood chain (which is also great and has a location on Restaurant Row), Fishbones is a pricier and upscale restaurant with very similar dinner entree’s as Charley’s Steakhouse nearby but with a focus more on Seafood over steaks with fresh fish that varies daily that may include Salmon, Grouper, Ahi Tuna, Sea Bass, and Snapper. Filet Mignon, New York Strip Steak and Prime Rib is also available for those patrons looking for a meat item. #9. Cafe Tu Tu Tango – Cafe Tu Tu Tango has been around serving delicious small-plates of courses meant to be shared before anyone else out there was doing it. Cafe Tu Tu Tango is a unique place and was a favorite restaurant of ours during our college years. Some of their most popular dishes are the Cajun Chicken Egg Rolls that are filled with roasted corn, chedder and goat cheese, and a Creole mustard dipping sauce and the Oriental Marinated Steak Skewers with ginger-soy aioli. The atmosphere is artsy with the slogan stating that the restaurant has “Food for the Starving Artist”. #10. Del Frisco’s Double Eagle Steakhouse – A lot of Orlando locals were glad to hear about the return of the Del Frisco’s to the Orlando area with their newest location directly across the street from Point Orlando. Del Frisco’s Double Eagle Steakhouse is known to serve some of the best steaks across the United States and Orlando is no exception. You will definitely impress your date with a Valentine’s dinner at Del Frisco’s. Jack’s Place – Honorable mention goes out to Jack’s Place at the Rosen Plaza Hotel within walking distance of Pointe Orlando. Jack’s Place has been open in Orlando for several years that has a personal story that goes along with the establishment where you will enjoy the history of the pictures that surround you during your meal and also on the quality of the appetizers and entree’s that are served. Jack’s Place is not as fancy or modern as some of the other restaurants that we have included (or have not included) on our list but it falls into the same category of another local favorite of ours, Le Coq au Vin, in it’s charm. Click here to read our full review of Jack’s Place. Making recommendations on things to do along International Drive on a date night out like Valentine’s Day is like picking out a flavor of ice cream at an ice cream parlor. There are a lot of options to choose from that someone is going to enjoy but probably only five or six that are going to appeal to you. There are a few miniature golf and go-kart attractions as well as the Ripley’s Believe or Not Museum. If the Pac Man cafe mentioned previously sounded like a good time, there is a Dave and Busters arcade along I-Drive. We also really like the iFly indoor sky-diving attraction but this is something that you will want to do before you eat dinner. Kings Bowl offers bowling for couples that you can read about in our review here. The Orlando Eye, Madame Tussauds, and SEA LIFE Aquarium are also now open on International Drive. Of course, there are also the Orlando dinner shows of Sleuths Mystery Dinner Show, Pirates Dinner Adventure, and the Treasure Tavern Dinner Show along I-Drive that can be fun if you are dining with a group of friends or family. At Pointe Orlando, the Orlando Improv has standup comedy that is always a lot of fun, the Regal Cinema Movie Theater to catch a movie, Blue Martini to get a late-night drink, as well as live music at BB King’s Blues Club mentioned previously. If you want something a little more edgier and a little more seductive, Drip will be having several shows on February 11th, 2016 through February 14th, 2016 that you can find out about here. Note that the show can get a little messy with flying paint and sand so you will want to wear something you don’t mind getting ruined (jeans and a white t-shirt works). There are several other restaurants that we could have included if this was a Top 12 or 15 list but we capped it at 10 for consistency sake. Other restaurant choices that we can recommend on International Drive include Texas De Brazil, Napa at the Peabody Hotel, and Spencer’s for Steaks and Chops at the Hilton Orlando, Everglades Restaurant at the Rosen Centre, Cuba Libre and Tommy Bahama Restaurant and Bar at Pointe Orlando. If you are going to be spending the day at SeaWorld, we recommend dining at Sharks Underwater Grill with real live sharks swimming around you while you dine. There are also several chain restaurants to choose from including Tony Roma’s, Bahama Breeze, Buffalo Wild Wings, Olive Garden, and Uno Chicago Grill on International Drive. This entry was posted in Restaurants and tagged date night, dinner, dinner shows, international drive, seaworld, top ten, valentines day. Bookmark the permalink.